WASHINGTON — Consider yourself invited to a show you’ll enjoy like the Dickens. Arena Stage presents the hit musical “Oliver!” with a modern “twist” now through Jan. 3. Based on the book by Charles Dickens, orphan Oliver Twist (Jake Heston Miller) is booted from his London orphanage after holding up his soup bowl to say, “Please, sir, I want some more.” He crosses paths with the Artful Dodger (Kyle Coffman), who invites him to join a group of pickpockets run by Fagin (Jeff McCarthy) under crime boss Bill Sykes (Ian Lassiter) and his gal Nancy (Eleasha Gamble). As for his own role, McCarthy loves the complex nature of Fagin. The iconic story has seen many incarnations since Dickens wrote it in monthly installments for Bentley’s Miscellany magazine from 1837-1839 and published it as the novel “Oliver Twist” in 1838. By the 20th century, the story saw a number of film adaptations, including Frank Lloyd’s silent film “Oliver Twist” (1922), starring Lon Chaney as Fagin, and David Lean’s classic “Oliver Twist” (1948), starring Alec Guinness as Fagin in a movie voted among the Top 50 British Films of All Time. The new Arena Stage show is a more contemporary take than these previous versions. So how does the show meld our traditional understanding of “Oliver” with new surprises? Indeed, those who attend the shows are in for a treat as soon as the Artful Dodger hits the stage for “Consider Yourself,” as actor-dancer Kyle Coffman glides across the stage like Michael Jackson. While the dance moves are more modern, the themes translate perfectly to 2015 with contemporary echoes of Dickensian class divides. But it’s not all doom and gloom. 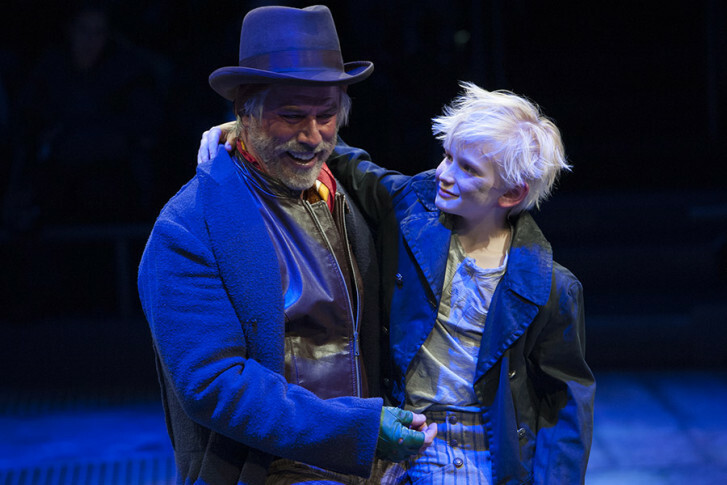 Amid the heavy themes, “Oliver!” is also rousing entertainment. Listen below to the full interview with Jeff McCarthy, conducted prior to show’s opening.